Class Schedule Upcoming Events Memberships! I started CrossFit when I was 32 years old and just had my 3rd son. I didn’t come from an athletic background or play sports in school. I didn’t even know much about CrossFit and I’m sure if I did I would have just stayed home. Everything was hard and everyone was better. My first WOD was Hellen. I remember dying on the run. Struggling on the band for pull ups and the 10# plate for the KB swings. I couldn’t understand why people kept showing up. How could this be fun?! Definitely didn’t love CrossFit at first. Before I knew it one day turned into weeks and weeks into months and I started to see progress. My clothes started to fit better. More than the way it made me look, I loved the way it made me feel. I felt strong for the first time and it was empowering. I was a better mom because of it. A few months later I got my level 1 and started an internship at CF Solano. I’ve been a full-time coach since. I started Crossfit in October of 2016 at Interchange Athletics because I needed something to fuel my competitive nature after training and competing in Muay Thai for over 6 years. I was very cautious about starting Crossfit because of all the negative things I'd heard about the sport, but after trying it and understanding the scaling options and how much the coaching staff put emphasis on technique, I knew that I had found my new addiction. I love learning from the coaches and the athletes here at Interchange because everyone has their own style. I love the environment and the energy all the coaches and athletes bring to this gym. Being part of the Coaching staff will not only let me help athletes but it will also help me become a better athlete myself. Exercise has always been a part of my life and I enjoy the therapeutic benefits and the opportunity to share that with others. I pride myself on bringing a little sass to my class, so be prepared for fun! I use my passion for music, my love of outdoors and cycling to guide my classes on an energetic journey! My classes are constantly changing in order to motivate, challenge and create an environment where anything goes. I am a certified Spin instructor since 2015 and have multiple TRX certifications, so I enjoy bringing the same type of enthusiasm to those sessions as well. Whether it be group classes or one on one sessions, our focus will include strength, conditioning and ultimately improving your health! I was introduced to CrossFit in January 2009 while attending my tech school for the Air Force. I love CrossFit for it's ability to bring people together from all backgrounds in a fitness and social setting that impact their community and positively affect their health and wellness. I took the coaching plunge in 2015 and have enjoyed working with athletes ranging from wounded warriors to senior citizens and kids. My journey at CF Interchange Athletics began in August 2017. Eager for a new gym I could call my home, I was drawn to CF Interchange as I drove by (going to and from Starbucks 🤪), and saw people who looked just like me working hard doing impressive physical exercises within the gym walls. I joined and immediately fell in love with the new place I would call my home away from home. 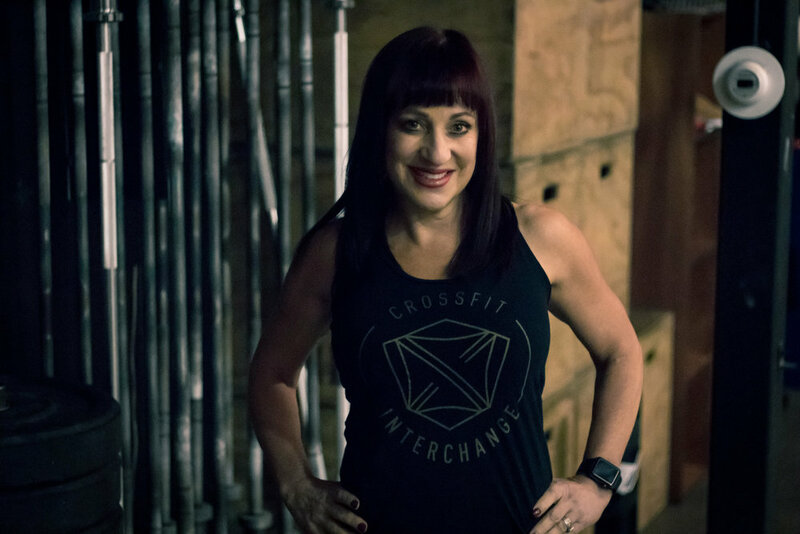 I became an avid CrossFitter, participated in several CrossFit competitions as a Scaled competitor, and joined the 2018 and 2019 CrossFit Open. After an incident with a St. Bernard puppy, I injured my knee. My squat days had to be put on hold. I did not want to stop coming while I recovered and I knew how healthy Spin is cardiovascularly and that it is gentle on the knees. I began taking Spin and I loved it! I recovered well, and I noticed my endurance greatly improved as a result of coming to Spin. I now run 5K’s, quarter marathons, and am back more than ever to CrossFit. I am so excited to join this team of Coaches who have inspired me, motivated me, and helped me believe in myself from Day 1. My goal is to do the same to any and all within my reach. James’s fitness journey began when he discovered a home workout program called Insanity... Amber knows all about it and is forbidden to share any more information out it with you😂 After that he was introduced into the world of Crossfit. After training for a year or so, James left for the Air Force. Even bouncing around to different bases, he would frequently visit home, and in turn visit to train with familiar coaches. From there he went overseas to Germany and trained under Rob Powell at Crossfit Ansbach where he discovered power lifting. He finished his military career at Vandenberg AFB, and discovered another gym called Crossfit Ohana. There he found olympic weightlifting. Upon exiting the Air Force, he got his USAW level 1 and has been coaching ever since. I am an active duty Vet and I currently work as a motion graphic designer for NBC Sports Bay Area. Fitness has been a part of my life since I was a kid and I love to share that energy with everybody, including my 11 year old son. I have been CrossFitting for about 5 years and loved every PR and struggle that came with it. Outside of Crossfit, I enjoy bouldering, rock climbing, and snowboarding. My passion isn’t about being the strongest or fastest competitor, but rather sharing my knowledge and growing as an athlete TOGETHER in a community. I am excited to be a part of the team! I have spent most of my life moving my body. With a background in gymnastics, dance, horseback riding, and baton twirling, I fell in love with yoga for its body toning and healing powers. I believe yoga can cure life’s case of the Baddies and that a regular yoga practice will balance the ups and downs of everyday life. When I’m not on the mat, I enjoy hiking, reading, writing and spending time with 4 legged furry friends. My classes are playful flows where you can build strength, confidence, and balance, while freeing your soul. Shake off your workout, breathe, and relax with me. I fell in love with the sport and community of Crossfit from the first day I tried it! I've now been doing Crossfit for about 8 years. I also enjoy kayaking, rock climbing, backpacking and cooking! I got my NASM certifications I 2016 and became a Crossfit L1 coach shortly after. I grew up in Castro Valley, CA and moved to Louisiana in 2017 where I coached full time and obtained my L2 certifications. I since have spent over 1,500 hours coaching and helping others to live healthy and fit lifestyles! I first started Crossfit when I joined the gym in 2017. Before that I had dabbled in a few home fitness programs but still felt the need for something more. I enjoyed bootcamp workouts and Amber encouraged me to try Crossfit. I am thankful she did. Crossfit has done more than just improved my fitness. It has pushed me past limits I didn’t think were possible. I was always the kid in school that hated PE. Run the mile...um no thanks. I actually never ran a whole mile in my entire life until Murph. The great thing about Crossfit is that there is always more you can improve on. It is ever changing and constantly requires you to push past your limitations. I also enjoy the community aspect of Crossfit. It is the community that makes it something special and the same can be said for Bootcamp, TRX and Spin as well. We all come together to achieve a common goal of improving our lives and bettering ourselves from the inside out and to me that is something that is really special. I’m a registered yoga instructor (RYT200). I graduated from the Maui Yoga Shala in Hawaii after an intense 200 hour program. The program focused on styles of yoga including Ashtanga, Vinyasa, Hatha, and iyengar. This training also educated the trainees on technique, anatomy, and philosophy. Interested in Interchange Apparel? Click Here!